What we wanted in a sitting room was very simple: a place to cozy up with warm mugs of coffee or tea, and share. Hearts, stories, laughs, secrets. Adventures, heartbreaks, hopes and dreams. We wanted an intimate space, layered with pillows and cozy blankets and piled high with stacks of books. A place for getting to know new friends and making new memories with those we've sojourned with for decades already, a place for truth telling, vulnerability, healing and new hope. We wanted it to evoke refuge and rest, the kind of space you smile when you think of it, remembering shared tears and confessions or the time you laughed so hard you cried. And we did not want a television anywhere in the vicinity, that was non-negotiable. This room embraces you the moment you step thru our door. It's simply furnished with two love seats and a cushy chair we found on craigslist and slipcovered. 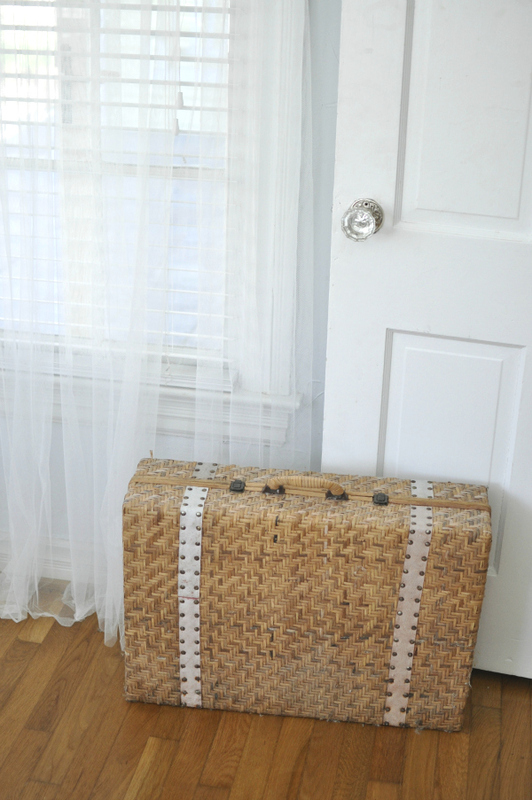 A stack of vintage suitcases by the door serves as a the perfect spot to drop keys coming and going. They also work great for extra storage. Each were all picked up at various flea markets, with the exception of the one on bottom. I found it out thrifting with my mom one afternoon, discarded on the curb. I was pleasantly surprised to crack it open and find it lined with gorgeous lavender satin. We found this lovely wrought-iron hall tree at a garage sale for $10. A coat of paint and subtle distress work made it the perfect addition. Loads of vintage books and a couple of gorgeous old mirrors warm up the space. It's no secret I'm obsessed with old books, so much charm. I have them stacked in literally every room and cannot stop myself from buying more, constantly. I'm drawn to pretty colors and/or titles, and absolutely taken with books of poetry or music. Cannot resist. Hopeless love affair. We're currently gearing up to re-do the entire ceiling in this room. New recessed lighting and a gorgeous plank ceiling will soon make their debut. That alone will totally change the feel of this space. We've debated an antique tin tile look and considered bead board as well, but plank keeps re-surfacing as the feel we really want. Baskets of magazines are tucked under furniture and a wall of our travel photos run up the stairs. I get a lot of comments about having white furniture with a toddler, but it's so easy. I can pull the slipcovers and toss them in the washer when necessary. Far easier and cheaper than buying new furniture or scrubbing for hours every time we have a spill. Simple, humble, quaint and cozy. Just what we wanted. 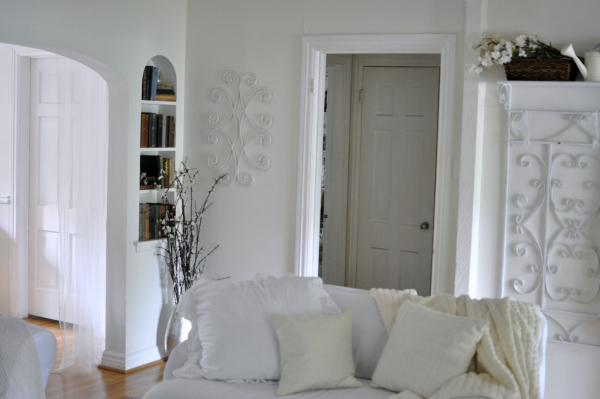 Up next on the Cottage Tour: the Master Bedroom! Our beloved little kitchen was once the room I most disliked. Too small, odd layout, little counter space... the list goes on and on. I originally wanted to gut it entirely and start fresh, but an endless list of other pressing projects left no budget for an entire kitchen overhaul. We opted instead to open the cabinets up, tear down a crazy number of strange light fixtures, replace all the dated appliances and freshen up the entire space with a warm coat of creamy parchment colored paint. It's amazing how a few thoughtful touches can transform a room. This cozy space has truly worked it's way into my heart. In fact, I'm not sure I even want to overhaul it anymore. Perhaps it's because I spend an incredible amount of time here chopping and dicing at the butcher block island, stirring pots and pans over the stove, scrubbing dish after endless dish as I gaze out over the backyard. Or maybe it's the endless conversations that happen with friends far and wide as they pull stools up to the counter and settle in while Josh kneads pizza dough and I pile up wooden platters of dates and olives and figs to tide us over. Maybe it's the light in this space, the perfect little window over the sink draped in gauzy curtains, the ease of having everything within reach, or my blissful baking corner across the way. Whatever it is, she sure has charmed me, quirks and all. A collection of antique blue Ball jars were picked up at flea markets and thrift stores, and the vintage cookbooks came mostly from our annual library sale for 50 cents a piece. We go every year and always land a few gems, once Josh even stumbled upon a leather bound jewel printed in the late 1600's. It's a favorite. 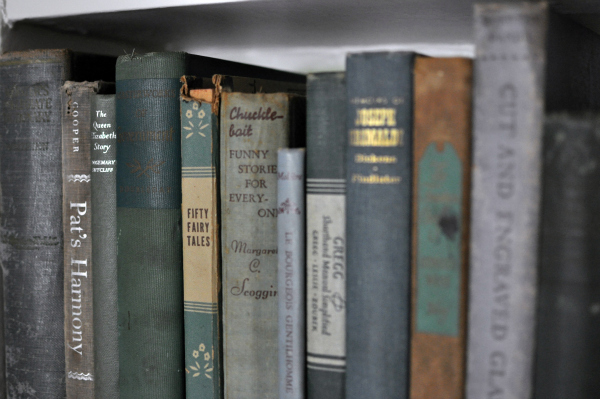 We have a serious love of antique/vintage books. We have stacks here and there everywhere. Our cookbook collection got legs after we came home with a huge load a couple years back after a local elderly woman donated her entire collection for the sale, a couple thousand in total. 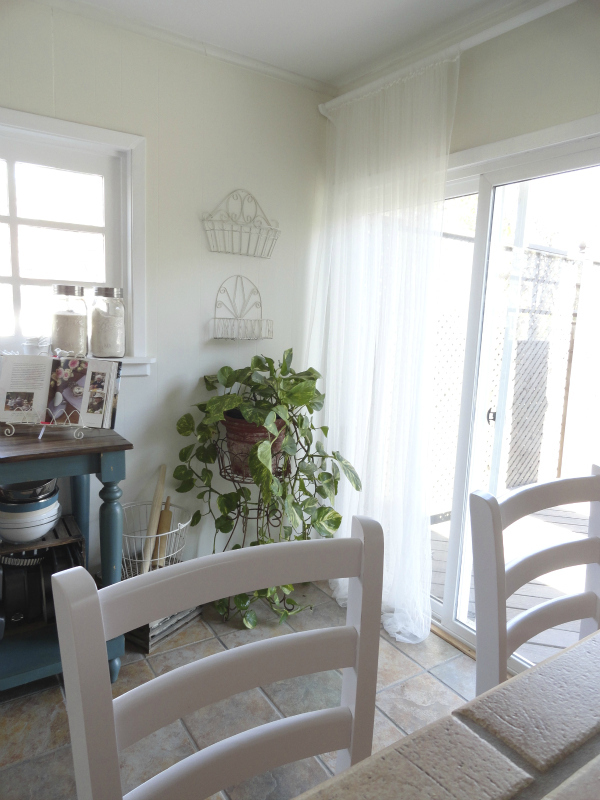 Sliding glass doors look out over the deck and backyard and simple, gauzy curtains from Ikea soften the space. I love elegant curtains in kitchens. A bit unexpected, always ethereal. $10 Craigslist stools, a perfectly rusty flea market plant stand, a couple of baskets on the wall I saved from a curbside junk pile and freshened with a coat of paint. The chippy white iron roses and vines mounted on the right remain one of my favorite flea market finds to date. Once upon a time they served as porch pillars. 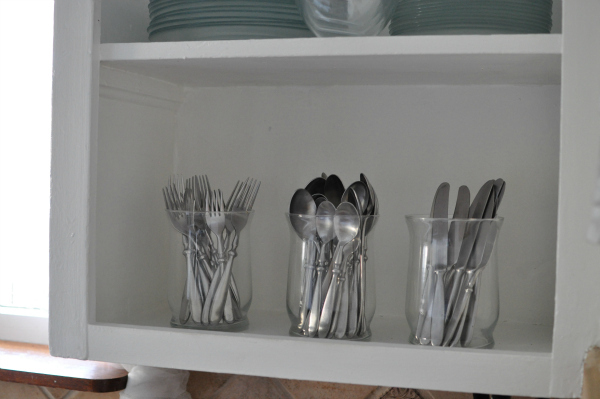 White and glassware are both inexpensive and easy to come by and look clean and organized without even trying. I have an entire collection of serving ware as well I've picked up for nickels and dimes, literally. Flea markets, thrift stores, garage sales, even dollar stores. And the best part? If they break, no big deal. You won't even miss them. I simply keep my eye out for pretty pieces when I'm out and about. Opening up the cabinets means guests feel more at home. They never have to ask where things are kept or feel awkward pilfering thru closed doors and drawers. It works perfectly with our B&B vibe. The collection of empty wine bottles is another favorite element. We've collected them for years. Each has a small scroll of paper inside: unread love notes between Josh and I, a few secret hopes and dreams, scrawled prayers, a few with special reminders of where we were, who we were with, what we ate... No plans to do anything with them, all those lovely bottled secrets. Maybe we'll leave them for our kids someday. I love the idea of our children sitting around in some distant future, uncorking each bottle and marveling at our dreams and prayers, our love story. Humble and quirky and a bit hodge podge-y, light and love-filled to the brim. I literally spend at least half of every day here. I can't say we won't make big changes in the months and years to come, but for now she sure is warm and hospitable... like a lovely old friend. And that definitely causes me to pause and reconsider. Do you have a room or space you've grown to love? You guys know I like to bake, right? I might like to cook, but I love to bake. It's in my blood. My mom is a baker, always has been. My little sister and I both grew up sitting on the kitchen counter licking batter off wooden spoons, patiently waiting with a pat of butter to slather all over whatever hot and yummy was about to emerge from the oven. 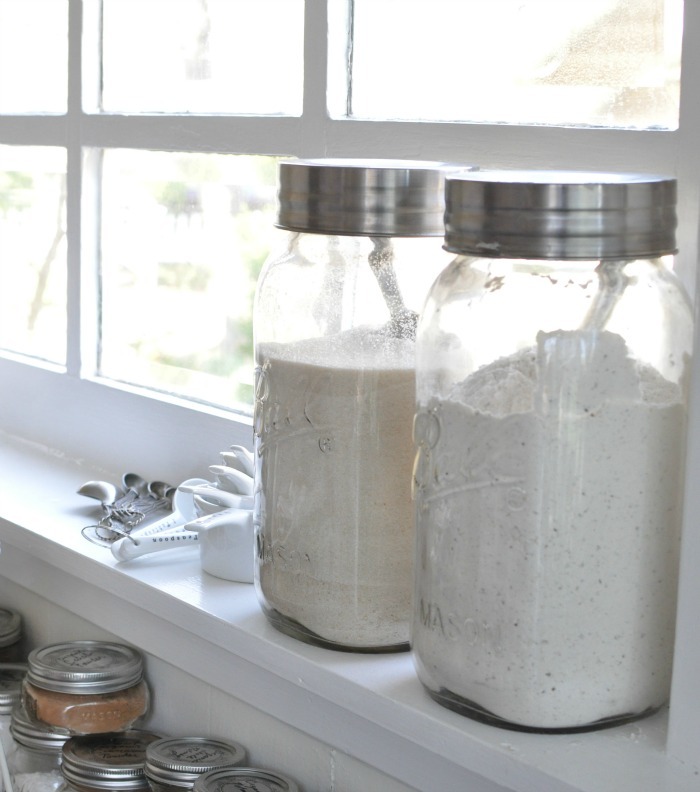 It's long been a little dream of mine to have a corner in a kitchen dedicated soley to baking, and the moment I laid eyes on the gorgeous antique beveled glass window in our kitchen, I knew my dream was realized. Our kitchen is not laid out well. Of course when this house was built they didn't consider the same conveniences we do today and certainly that's part of the charm. But somewhere over the years there was some renovating that turned part of the counter into a raised breakfast bar. Not a terrible idea except that it backs immediately to a small 'eat-in' area, and just across the room on the other side of the kitchen is the dining room. Seems downright silly to have three eating areas on top of each other, not to mention if you actually put any kind of table in the 'eat in' area it becomes entirely too crowded. It is however, the perfect space for a baking corner! I wanted it to be simple and well organized with a side of pretty. Muffin pans, mixing bowls, mason jars of all sizes filled with baking staples. An old metal egg gathering basket stacked atop a antique wooden egg crate holds rolling pins, and a small wicker basket hides bottles of vanilla and lemon and peppermint oils. A little greenery, part of our vintage cookbook collection, the trusty Kitchenaid mixer. What else could a girl want? Thanks to the gorgeous window and set of sliding glass doors just to the right that look out over the backyard, it gets tons of natural light filtering down thru the canopy of leaves. Even on cloudy, dreary days there's rarely need to turn on the lights. And most of the year when there are actually leaves on the trees this window is full of lush greenery, chirping birds and playful squirrels scampering about. I spend a lot of Saturday and Sunday mornings here, and the occasional weekday afternoon when Ev is napping. You likely see lots of Instagram photos with this as the backdrop. I truly love it, the joy of recreating my own childhood memories as Everyn toddles around chasing the dogs with a wooden spoon in each hand, or climbs underneath and pulls all the pans onto the floor. We bake for friends and neighbors, play dates, and anyone who comes to join us for a weekend. It's a love affair, me and this little corner. Eventually we'll rip out all the tile and lay large plank flooring, farmhouse style. Until then, she'll keep humbly bringing joy far and wide to all the friends who share in the fruits of her labor. Do you like to bake? How do you stay organized? It boasts beautiful travertine tile on the floor and shower walls, a gorgeous old dresser turned vanity, and a sunny little window draped in foliage which causes the afternoon sunlight which spills thru into the hallway to dance and dazzle with the slightest breeze. It is not uncommon to find me standing there mesmerized for long moments when the light is just so. It makes me want to write poetry. As with every room in this house, it's simple and practical, but also enchanting. A plush rug and fluffy white towels were all it took to prepare this room to welcome quests. I've been on the look out for a gorgeous old oil painting to adorn the entry wall, but other than that I'll leave her be. I prefer bathrooms to feel clean vs cluttered. Besides, she's doing just fine without me frilling her up too much. Our bright, serene little guest suite is tucked nicely in its own private corner. Situated on the west side of the house it isn't illuminated with morning sunlight the way our master is, which means guests can comfortably sleep late if they prefer. The goal with this room was both comfort and beauty. We wanted it to feel much like a bed & breakfast: lush linens, soothing colors, lots of charm, fluffy pillows and cozy blankets. No fuss, but certainly ambiance. Let's take a little tour! What I love most about this room is the history. My Grandad's kerosene lamps, my great Aunt's piano, a favorite quilt hand sewn by my great Grandma George. There are odds and ends passed down from my Grandma Suzie, to my mom, to me, a beautiful little desk I fell in love with at a local antique store that Josh later surprised me with, a collection of beautiful hankies belonging to both my great Grandma and Josh's. So many lovely memories filling a single room. With the exception of a small handful of items, everything it this space from the mirrors to the chandelier were either salvaged from a junk heap or picked up at flea markets and estate sales. Stacks of vintage sheet music, huge spools of lace, weathered old shutters and window panes, a collection of stamped post cards from the 30's and 40's... so many things I love. This cozy room sees tons of traffic with friends and family constantly passing thru, but we're always taking reservations. At our last place we had a huge dining room we rarely used. Both our table and buffet were stained black, fitting for that particular space but definitely not here in such a soft, ethereal room. They both got a paint and distressing job when we moved in, and everyone seems to agree they were made to rock the shabby look vs. the dark, seductive style. The room fills brilliantly with morning sunlight, the perfect spot to wake slowly over a leisurely brunch. Josh and I often throw open the doors and sit with steamy mugs of coffee or tea, letting the breeze waltz with the curtains while the dogs lounge on the deck in the sunlight and Everyn searches intently for acorns. And in the evening as the sun sets opposite, it dims ever so appropriately for quiet dinners, helping us wind down gently. It's quaint, one of the features I love most about it. It wasn't made for huge dinner parties or entertaining. It was intended for small gatherings. One on one conversations. Sharing, honesty, depth. It lends itself well to story telling and laughter, the kind where you never have to repeat the punch line because certainly everyone heard it. It makes lovely introductions, the furthest thing from intimidating, it invites you in. Sit, share, ponder, savor. No rush, linger awhile, nibble, indulge in one more cup of coffee. Just one. There's time, always time. Like a charming little bed & breakfast ready to wrap you in her arms for a cozy weekend of books and blankets... there's never any rush here. Quite the opposite, in fact. Another feature I adore. Our table and chairs (pictured without the leaf) were purchased on Craigslist for $100, a serious steal. Originally it was stained a glossy blonde hue and every single piece covered with loads of hand painted purple grape bunches and vines. The cushions were covered with plaid pink and green fabric. 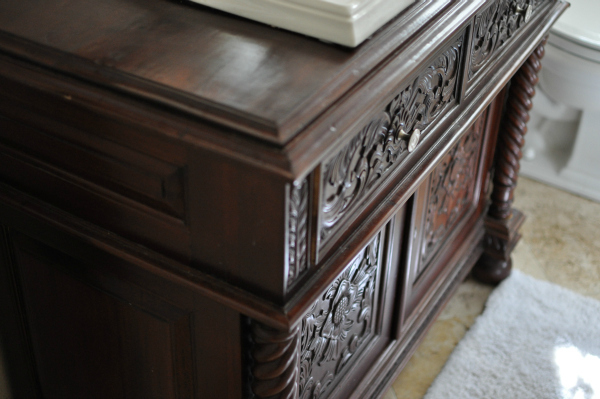 We stripped it, stained it ebony and recovered the cushions, and later painted it creamy white (as I mentioned). Having previously stained it black actually added perfect layered detail once I distressed it. The oil painting we brought back from our first trip to France several years ago. 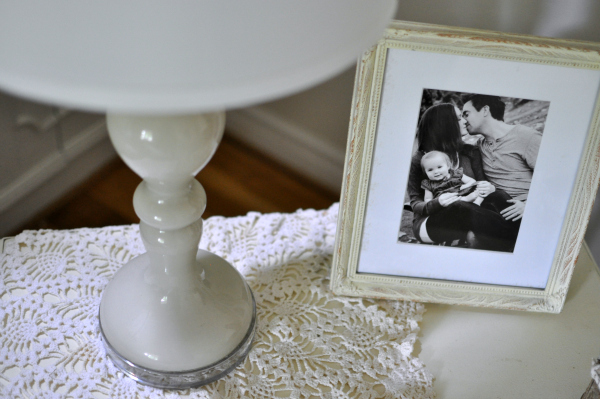 I had my dad build a simple frame for it with moulding from the hardware store. We replaced the existing chandelier (now painted, distressed, and moved to the guest room) with the one you see here. It was a total splurge, but I wanted a beautiful statement piece for this simple room to add a little drama. The solid mahogany buffet was a gift from my mother-in-law. We stumbled upon it at a Swiss Avenue estate sale for a shocking $34! We easily repaired a drawer and sanded her down before adding a coat of black paint to go with the then existing dining room furniture, but were never really happy with the result. 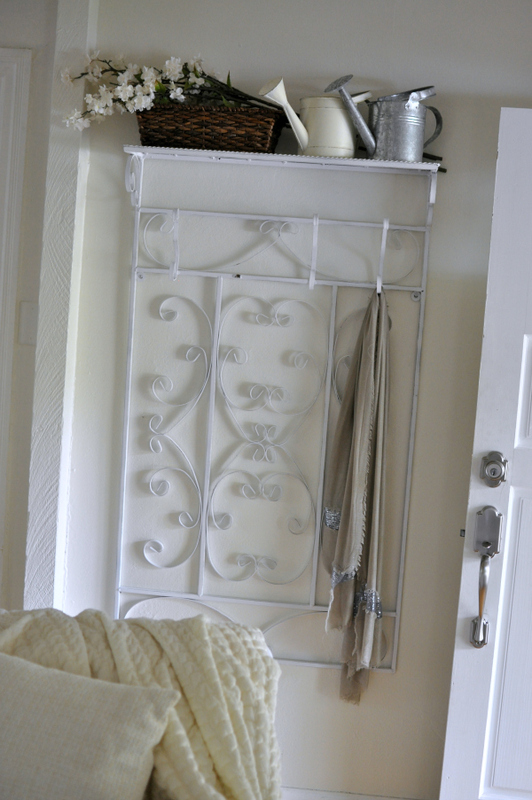 Creamy white paint and distressing made all the difference here, too! Now we love it. Atop the buffet is a small collection of antique decanters and pitchers collected from flea markets and estate sales, and on the wall above them (not fully pictured) a framed trio of some of our favorite travel photos from Italy, England, and Greece. All of my table linens are picked up at garage and estate sales or thrift stores. I never pay more than a buck or two at most. I rotate inexpensive fresh cut flowers and white table linens every week or so. It changes the feel but also keeps the space feeling fresh and beautiful. A couple remaining details in this space will be an elegant rug as soon as I stumble upon something I love, as well as new/different fabric on the seat cushions. It's fine for the moment, but eventually I'll change it out. So there ya have it, our bright and cozy cottage dining room. Won't you join us for brunch soon? ?